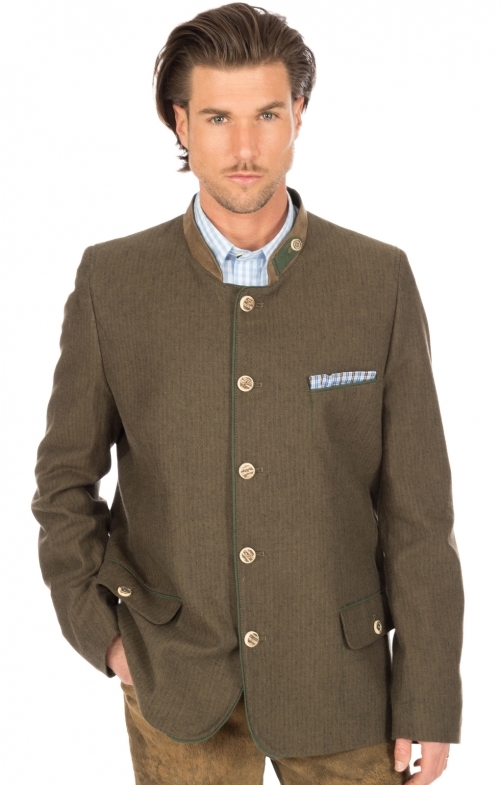 Traditional herringbone jacket with perfect features. For business and occasions in the cultivated traditional appearance is desired. 60% cotton / 40% linen. A jacket in the traditional style of the straight in the summer through the linen all its benefits plays out as lightness and breathability. The workmanship is of high quality and recognizable by the leather borders in fir green or the raised collar made of leather. Real stag horn buttons with which the flap pockets are buttoned. The cardigan is smooth in the back and worked without back bar, but with a green central piping made of leather. The handkerchief with its design of the traditional jacket inside is completely lined loosens the well-groomed solid appearance of this traditional jacket and still shows class.